Imagine a new and different map of the world, one made up of a series of concentric circles with peoples and nations organized according to their access to the gospel. On such a map you and I would occupy the warm gospel-saturated center. People groups with less access to the gospel would occupy the concentric circles radiating away from the center. Those with the least access to the gospel would live on the cold and ragged edge — the outermost concentric circle on the map. Losing sight of those who live on the ragged edge is easy, especially in our selfie-obsessed culture that tempts us daily to regard ourselves as more important than others. But that’s not what Jesus envisioned for His church or His followers. He called us to look beyond ourselves and take the good news to all peoples, including those who live in difficult places near the ragged edge. In recent years, missiologists have called Christ-followers to turn their attention to those who live on the ragged edge and to make these last places first. The majority of the unreached and unengaged people groups in the world today live in the 10/40 Window. This rectangular-shaped geographical area is located between 10 and 40 degrees latitude north of the equator and stretches from North Africa all the way to the Pacific Rim. The people groups in the 10/40 Window live in broken and cold places that have yet to feel the healing warmth of the gospel. Our missions ministry is committed to moving toward those who live on the ragged edge. In cooperation with our partners, we are sharing the good news, planting churches, equipping church leaders, and battling on the front lines of poverty, disease, hunger, injustice, and exploitation. 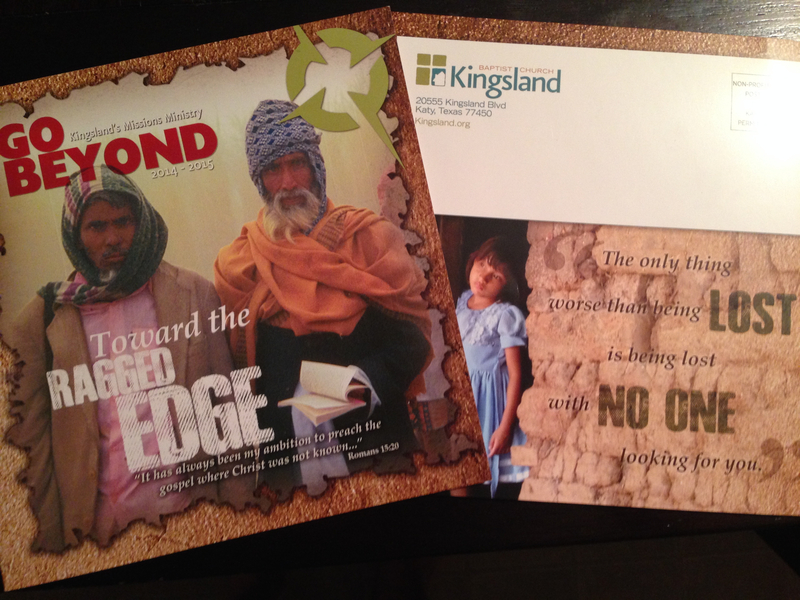 December is month of missions at Kingsland. This is the month we contribute to the Lottie Moon Christmas Offering to support more than 4,800 Southern Baptist missionaries serving worldwide. And, your gifts to Kingsland’s Go Beyond Missions Ministry also help us as we labor to make last places first. If you are a Kingsland member or guest, please watch your mailbox the first week in December. You will receive a special copy of our December Go Beyond publication that tells the story of how our missions ministry is engaged on the ragged edge. My prayer is that as you read this report God will inspire you to pray, give, and to consider engaging in one of our international missions initiatives in the coming year. Thanks in advance for making it possible for us to move from the center toward the edge — away from comfort to inconvenience and away from safety to risk. After all, movement toward the ragged edge is a matter of life and death for those still waiting to hear the joyful and good news that we will celebrate this Christmas.